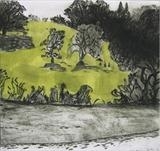 This completes the series of prints describing a section of riverbank, drawn during an outing by canoe in the early autumn. This completes the series of three drypoints made in January and February 2013. The artist has a canoe with which she can visit banks of the river less accessible on foot. 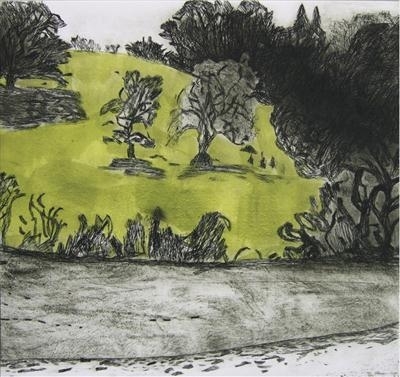 The panorama of Ashprington Point has the qualities that Susan enjoys to draw; oak trees sitting in open space where they can spread their limbs naturally, against bright green grass. Having visited the River throughout her life, its familiarity helps her to draw it as though it were an old friend.